Preparation time: 30 minutes. Marinating time: 1 hour. Cooking time: about 4–6 minutes. In a small bowl, whisk together olive oil, margarine, lemon juice, mustard, basil, garlic, and pepper; pour into a large, zip-top bag. Add shrimp and toss gently to coat. Marinate in the refrigerator for 1 hour. Preheat grill to medium-high heat. 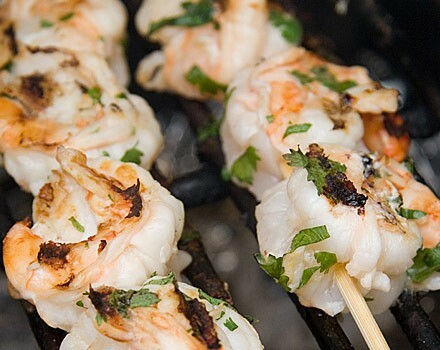 Remove shrimp from the marinade and thread on skewers. Coat grill grate with cooking spray. Arrange skewers on grill over medium-high heat and drizzle with any remaining marinade. Cook for 2–3 minutes, turn over, and continue cooking for 2–3 more minutes or until shrimp are pink and opaque. Leftovers may be eaten chilled or reheated. Exchanges per serving: 3 lean meat.